The Sacred Heart Academy Swim and Dive team brought home their 7th straight Kentucky High School State Championship Saturday at Ralph Wright Natatorium. Tickets are now on sale for the Sacred Heart Schools Multicultural Dinner! Ticket proceeds will support the diversity scholarship efforts of Sacred Heart Schools. 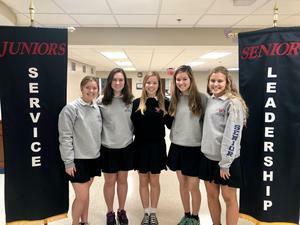 The Ursuline Education Network recently honored five Sacred Heart Academy students with the Ursuline Student Community Service Award, presented annually to celebrate students in UEN schools with a deep commitment to service. Sacred Heart School for the Arts will help families celebrate the holiday season with multiple performances of three Christmas productions. Thanks to the efforts and generosity of the students, faculty and staff of Sacred Heart Schools, Christian Help of Mingo County will provide Christmas gifts to more than 100 families and more than 300 children. U.S. Secretary of Education Betsy DeVos announced Sacred Heart Model School as a National Blue Ribbon School of Excellence for 2018, one of only two Louisville schools honored. For two weekends in November, Sacred Heart School for the Arts, along with students from Sacred Heart Academy, will present the Tony-award winning musical Thoroughly Modern Millie.